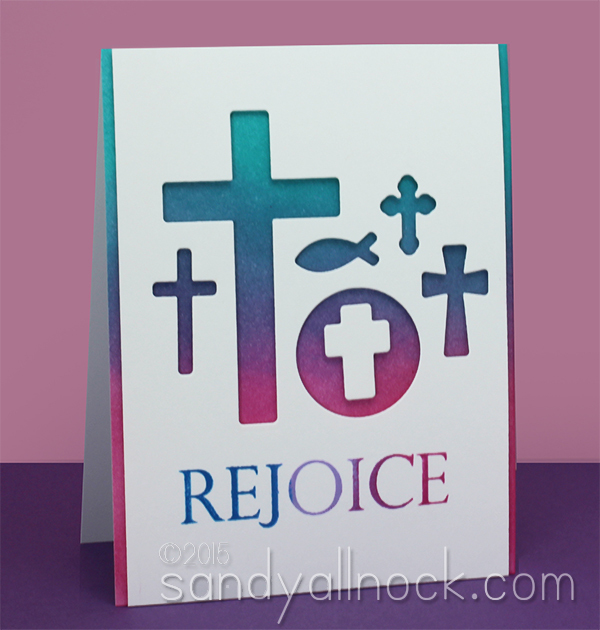 It’s almost Easter – and I needed to get some cards ready! I was excited to find inspiration in my own house – my cross wall art! The idea behind a cross wall is to collect all your crosses in one location in your home…and make them a conversation piece by doing so. Tell stories about where they came from, who gave them to you, and the stories behind them. When they’re scattered throughout your home, they don’t have nearly that impact – and people won’t ask about one cross on one wall, but a full display? You betcha! It’s art that serves as a living testimonial! The Crosses die set really got me – because it was laid out like a cross wall! 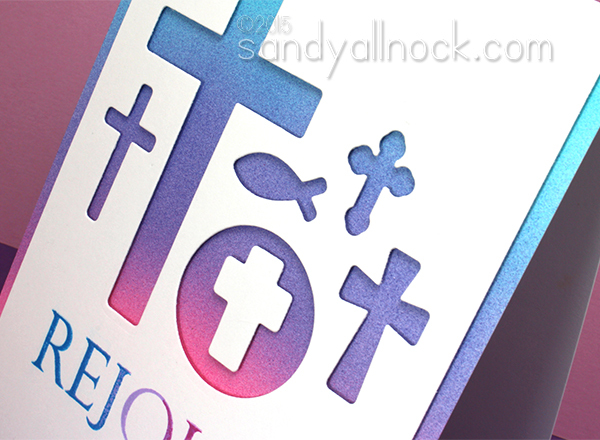 The die set goes with the Rejoice stamps – and not only can you get the stamps and dies as a pair in the He Is Risen set (can I get a “He is Risen INDEED!”???) – but you can get the Faith die set that includes the crosses PLUS a Praying for You die in the set too! I totally should have done that…*doh! * Do as I say, not as I do, right? Anyway…here’s my video showing you how I made this gorgeous card…and don’t be scared of the airbrushing, this can be done with distress inking too. Watch the video below, or click HERE to watch in HD on YouTube. Here’s that closeup of the card…It’s so pretty I may need to do a piece of art to frame for my house! This is the card made from the leftovers; I worked hard to get that blending a lot better on this background since more would show. And last but not least – the distress ink version! I applied it with the blending tool – Peacock Feathers plus Picked Raspberry. 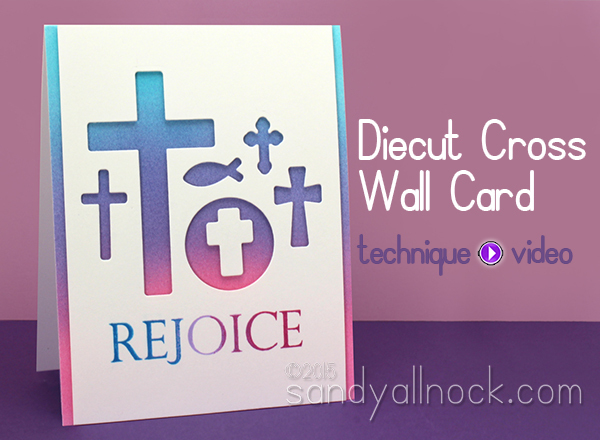 I made a whole bunch of these cross wall art cards while I had the Misti out – yeah baby! Lots with sympathy sentiments for my church to use. Sad occasion, but an uplifting card. OH! and if you are wondering what you need to get started with Copic Airbrush, watch THIS video. Love your creative and inspirational take on wall art!! You have quite a beautiful inspiration in your own home! Thanks for the video tutorial! Your cards are so pretty and they looked so easy to make… I made some of my own! Thanks for the inspiration, now my Easter cards are done!! great color combinations! Thanks Sandy! Your cards are awesome. Great job on both of them. Your cross wall is nice. I have about 4 crosses that have wonderful stories/people connected to them so I have the in various rooms in my house. I remember your wall of crosses. You’re right. It made a big impression on me and I can still remember it. Hi is risen indeed! I love your cross wall. When I get to my permanent location, I will have to gather up what I have and make one too. Love your cards as well. Really Love the card! So Simple but so pretty! These are so pretty & I love your cross wall. I used to have one, but it had NO where near as many as you have and the crosses didn’t have stories behind them like your’s do. Great Easter card. I really need to get started on my Easter cards. Lovely! I’m going to make some this weekend!